Multiple internal and external factors translate into large-scale transformation programs for an organisation. One primary reason for them to not deliver the outcomes is a lack of a good governance model, its implementation and acceptance within the organisation. Strong governance should not only be practised at a corporate level but also at a business transformation program or project level. The governance operating model and its implementation ensure that the transformation objectives are met, and they are realised in the business-as-usual mode when the transformation program is implemented. Ignorance, lack of commitment or failure to setup a governance model can backfire and be a recipe for transformational disaster. This article outlines the design considerations for setting up a governance operating model for transformation programs. It also describes a change governance process to further the effective implementation of the transformation program and transition to operations. A governance operating model defines the methods, structure and interfaces through which governance is mobilised. It is an imperative for transformation programs and enterprise governance boards to enhance their control and enable senior management to implement initiatives. Provide a streamlined approach to the review mechanisms and create efficiencies for key stakeholder groups and steering committee(s) in making decisions. Establish clear roles and responsibilities of the members of the governance steering committee and how they interface not only with the enterprise governance board but also other departments and operations once the governance operating model is implemented. Organise strategic, financial, compliance, operational and program level risk so that the governance committee can guide the program and/or operations to work in compliance with regulations and support the organisation’s objectives. The governance operating model is crucial in the ability to deliver the program’s services to the organisation. Having an effective governance operating model means that decision rights and service standards are clearly defined, regularly communicated to all stakeholders, well understood and adhered to. 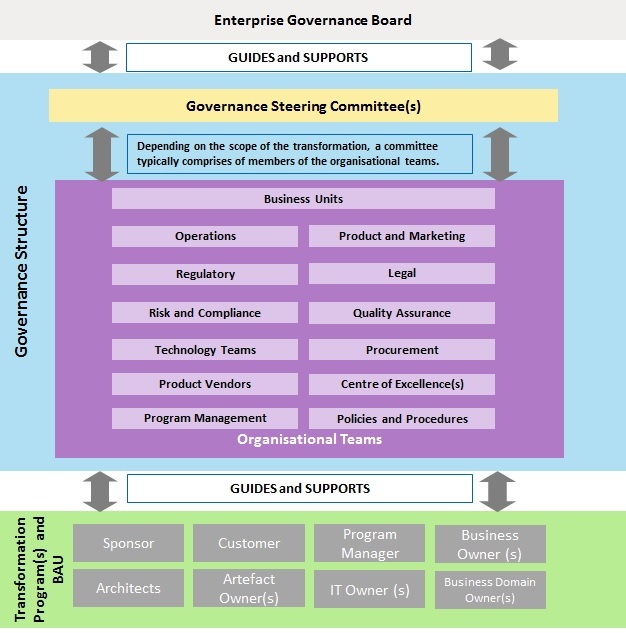 As shown in Figure 1, the Governance Steering Committee for a transformation program is guided and supported by the Enterprise Governance Board, which comprises of CxOs and senior executives. Depending on the size of the change initiative, there could be one governance steering committee for one transformation program and it will have a set of key stakeholders picked dynamically from various teams (e.g. Legal, Compliance, Procurement, Technology, etc.) as deemed relevant for the transformation program and are highly impacted by the program. The governance operating model will guide and support the program stakeholders to deliver the transformation program. It will also further support business-as-usual (BAU) teams once the transformation program has transitioned to operations. Once a transformation program has been absorbed into the company operations, the governance steering committee will cater to the governance issues arising out of the business-as-usual activities. Identify key stakeholders who will be part of the governance model and which departments in the organisation are impacted. Define boundaries of business areas which the governance should touch upon in the organisation depending on the scope of the program. Spread the word about the transformation program & governance operating model and socialise the same with the larger enterprise. Own and help to resolve changes to the artefact, process, and business capability. Establish a RACI matrix and get a formal agreement of their roles and responsibilities from these owners and their delegates. Review and endorsement of crucial updates to existing methodologies and frameworks i.e. insertion of checkpoints to connect with the governance committee if any major change is to be affected to any artefacts, business domains or processes. Develop a change and communications plan to broadcast the governance operating model & committee and absorb its implementation in the organisation. Agree on the frequency of governance committee meetings to be scheduled during the transformation and post implementation, log decisions and deviations, and publish the minutes of meetings. Establish a single source of truth i.e. a repository of decisions taken during the previous governance forums as this will aid in taking future decisions. Determine interfaces with the enterprise governance board. An enterprise-wide Governance Board will provide guidance and support to the changes across the organisation and help spawn governance committees for transformation programs as and when needed. The enterprise governance board will enable smooth implementation of governance operating model post implementation of transformation. Establish business ownership of programs and initiatives and establish clear roles and responsibilities and interfaces with the enterprise governance board. Once the transformation program has reached steady state and transitioned to operations, the governance steering committee will now perform the key governance functions required to sustain the change in business-as-usual mode. Once the transformation has reached its steady and/or transitioned into its operations and the governance operating model has been implemented, a governance process is required to maintain the operating rhythm of the governance committee. Primary function of governance committee then is to provide guidance to the business architecture activity i.e. ascertain, accept and absorb change into the system. 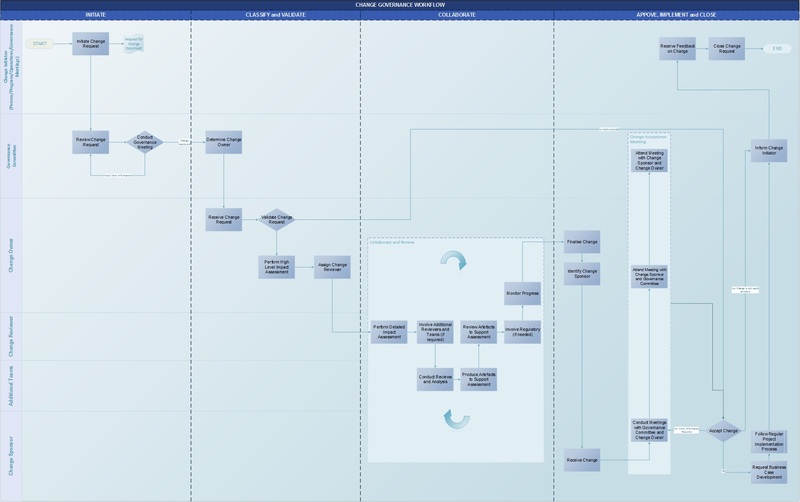 Figure 2 shows a process cycle that ensures than any change to the business processes, business capabilities, and artefacts in purview of the change are seamlessly absorbed into the organisation operations. Initiate – A request for change can be initiated for a business process, business capability, or an artefact. Any new program, any business unit or any person within the organisation can be a Change Initiator and initiate a request for change. Change Requests can also originate from the discussions in the regular governance meetings. The owner of the artefact, process, or business capability. Validate – The request is directed to the Change Owner for the related process, capability or artefact, who will determine if it is a valid request by performing a high-level impact assessment. If it is minor change, and needs no further review, it can be sent directly to the Approve If it is a major change, it needs further work/review. The Change Owner can assign a Change Reviewer to work on the request and loop in additional teams who should be involved in the review. 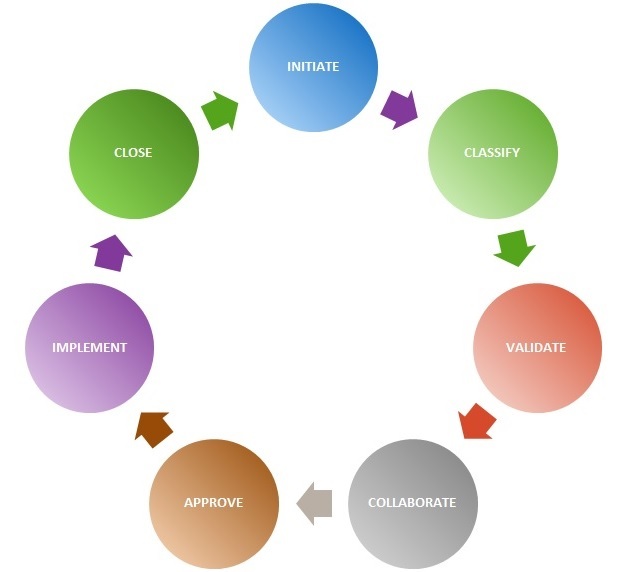 Collaborate – Once the validation is complete and it is determined that the change requires further review, the Change Reviewer will perform a detailed impact assessment of the change and understand its impact to other business capabilities, processes, and artefacts. More reviewers from the relevant departments can be invited to perform the review of the impact analysis. The Change Owner monitors the progress. Once the Change Reviewer is satisfied, the change request along with the supporting documentation and high level solution recommendation is passed back to the Change Owner. Wherever the change impacts regulatory compliance, the legal staff and auditors will analyse the proposed solutions to ensure that they are within the legal boundaries of the organisation. Approve – The Change Owner finalises the change. Depending on the impact of the change, the business unit that will be most impacted by the change request will have to own the change and appoint a Sponsor, who is typically the senior executive in the organisation. The Sponsor may call in meetings with the governance committee, change owner and his team to review the change request and finally accept or reject it. Implement – Once the sponsor is satisfied with the reviews, s/he will set aside some budget for implementing the change and may request a business case for funding the change. This may follow the regular program execution cycle within the organisation. If the Sponsor is not satisfied with the reviews, additional information may be called for. If the Sponsor is still not satisfied or if the need for change has passed due to the changing business scenario, the Sponsor may take up the validity of the change request with the governance committee and Change Initiator and reach an agreement to store it for later use. Close – Depending on the outcome of the Approve and Implement steps, the decisions taken during the processes are recorded in a governance log for future reference. The person or the program, who initiated the change request will also be notified of the outcome and kept updated throughout the process. Figure 3 below describes the end-to-end process model for the change governance process. Better visibility – The governance operating model, gives the enterprise governance board and the governance committee those eyes and ears into the transformation programs and the changes being made to the business capabilities, processes, and artefacts during operations. Greater coordination and compliance – The end-to-end governance process streamlines the review and approval process for changes to a business capability, process, or an artefact. The governance log of decisions provides visibility of changes with appropriate reasoning. The robust governance processes enhance compliance by involving stakeholders from legal and regulatory departments at the right time thereby reducing risk. Enhanced effectiveness – The governance operating model reduces the build-up of isolated approaches for managing change. As a result, action items are clearly de-marked for each stakeholder for the overall success of the transformation program and once it has transitioned to operations. The governance operating model ensures that the people aspect of the change is included in the approach and guarantees a greater chance of success once it is in business-as-usual mode. The success of the governance operating model will be directly proportional to how clearly the objectives of the committee have been outlined by the operating model. An effective governance operating model is an essential element for every successful transformation program. The governance operating model supplements the efficiency and speed at which the organisation embeds the transformation into its operations to achieve productivity, compliance and economies of scale. It also ensures that the right changes are owned and made to the right business capability, processes, and artefacts and those decisions surrounding these changes are clear and relevant to the entire enterprise. Clarity of formal responsibilities assigned to people involved ensures that they are accountable for responsibilities that need to be delivered. Centralised decision-making safeguards alignment of business units towards a common transformational goal.